A town in Posen, Germany, three miles from the Russian frontier. Its Jewish community formerly ranked among the largest of southern Prussia, and is mentioned as one of the congregations which suffered severely during the persecutions of the years 1648-51. Unluckily, however, all the early documents were destroyed in the conflagration of 1873, in which the synagogue, a beautiful old wooden building, also was burned. The gravestones of the ancient cemetery, which has been closed for about forty years, afford no historical data, since the great majority of the older inscriptions have been obliterated. Among the members of the community special mention may be made of Rabbi Ẓebi Hirsch b. Aaron Mirels, Rabbi Aaron Mirels (Kaufmann, "Die Letzte Vertreibung der Juden aus Wien und Niederösterreich," pp. 79 et seq., Vienna, 1889), and the Bible commentator Rabbi Meïr Löb Malbim. Ẓebi Mirels, who was called also Hirsch Aaron London, was the author of the "Mispar Ẓeba'am," and presented a Hebrew hymn to General Möllendorf when the latter was sent by the Prussian king Frederick William II. to receive the allegiance of the new province of southern Prussia ("Das Jahr 1793," p. 16, note, Posen, 1895). Rabbi Aaron Mirels, the author of the "Bet Aharon," is buried in the cemetery at Hirschberg in Silesia. In Wreschen, Malbim wrote his first work, the collection of annotations on the first chapters of the Shulḥan 'Aruk, Oraḥ Ḥayyim, which laid the foundation of his renown as a scholar. In Wreschen, moreover, the musical director Louis Lewandowski was born April 3, 1821. 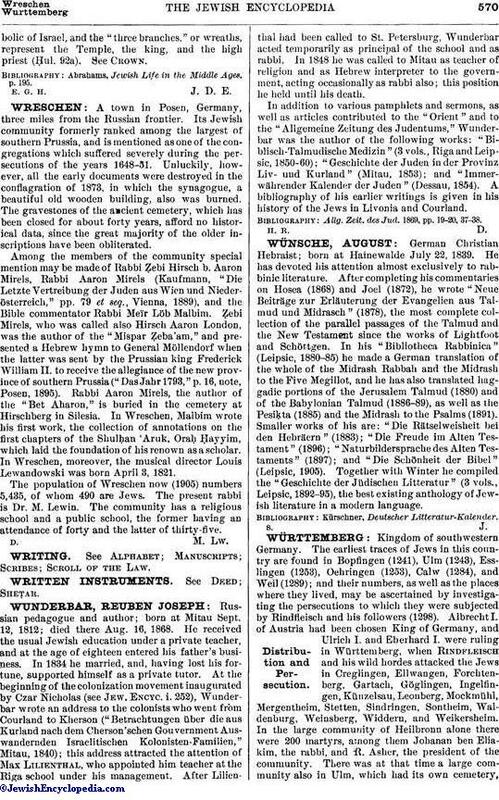 The population of Wreschen now (1905) numbers 5,435, of whom 490 are Jews. The present rabbi is Dr. M. Lewin. The community has a religious school and a public school, the former having an attendance of forty and the latter of thirty-five.